The League of Nations plan failed but Edwin Barclay did not sit idle. He was motivated by twin objectives—to project a better image of Liberia abroad and to improve her relations with the outside world, which, for obvious reasons, involved resumption of formal diplomatic relations with Britain and the USA. Barclay was determined to reform the country by improving public health, stabilize the economy, improve the judicial system, develop infrastructure, build more educational institutions and so on. He adopted a three-year development plan and hired about a dozen foreigners to take care of various projects. Soon the country’s sanitation improved vastly, foreigners praised the judiciary’s handling of suits, roads to the interior were being built and the economy showed definite signs of improvement. As part of his plan to develop the economy, he contacted several European companies to explore possibilities of minerals being extracted. The American and the British representatives were unanimous in their opinion that the country had improved beyond recognition. In the meantime, a change had taken place in the White House; Franklin Roosevelt had taken over. On the basis of the report of his assistant, the USA recognized Barclay’s administration. Britain, however, took a little longer to act. In Europe, the political climate was changing fast. Adolf Hitler attacked Poland. Britain and Germany were at war. The Second World War had started. Without delay Liberia, on advice of the USA, declared neutrality. Overnight the war made Liberia strategically important. With Senegal under Vichy France, the port of Monrovia became important. An airport at a convenient location became essential for effective and fast furnishing of aid ....Lend-Lease. So Robertsfield Airport was built near Monrovia. Barclay’s efforts to dig up minerals did not succeed during his time. But he had unknowingly put his finger on the right spot. About 15 years later, the same areas gave Liberia great deposits of high-quality iron ore. Liberia’s wobbly economy became the fastest-growing economy. 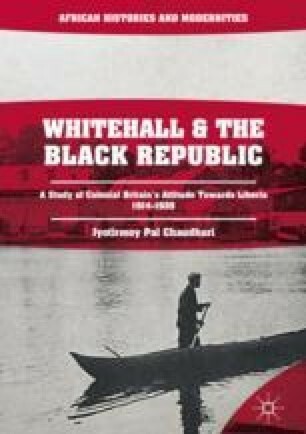 The Black Republic began to achieve more than mere survival.